Welcome to our Bed and Breakfast in Newquay . Book direct via the hotel website for promotional discounted rates. Open March to October and offering services normally associated with those of a superior type hotel, Pine Lodge is, in fact, a family run guest house situated in its own quiet grounds and yet within walking distance of the glorious beaches of Porth and Lusty Glaze - as well as being just a level walk from the centre of Cornwall's premier resort, Newquay! With just 13 guest bedrooms, we are able to offer our guests a pleasing range of hotel type facilities but with the distinct advantage of individual attention and personal service. Consequently, Pine Lodge is the perfect place to stay, attracting many return visits from holiday making or touring families, couples, business people and honeymooners - all of whom delight in our tranquil location and an unusual range of hotel type amenities... more often associated with larger, more impersonal (and more expensive) hotels. Individually styled en-suite guest bedrooms with colour television and beverage making facilities. Breakfast at our B&B:Full English plus continental and vegetarian choices. Free on-site parking for guests. Outside Heated Swimming Pool 40' x 20'. For the exclusive use of our summer guests (a real 'sun trap!') Open June-Sept (weather dependant). 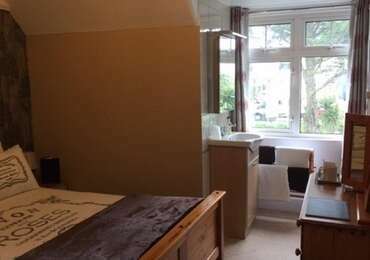 Our small double rooms are perfectly formed to give you a pleasant stay. They are all different in what they offer. All of these rooms have a standard double bed with views to the front looking the gardens or to the rear of the hotel.All of them are en suite and have a shower, toilet and a sink.Fancy a bit more space, why not try one of our king sized doubles. The family room provides space for 4 people.All family rooms have standard double beds and standard sized bunk beds or two single beds. The bathroom's all have showers. One of the family rooms has a bath as well as a shower. Cots can fit in these rooms if required. Cosy room decorated to give the beach hut feel. 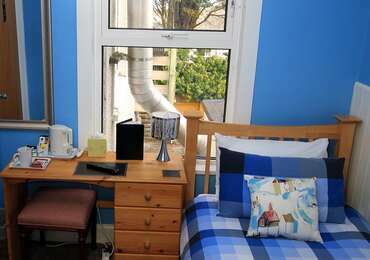 The room has a standard sized single bed a dressing table and good sized en suite. This room benefits from distant sea views.